The National World War I Museum and Memorial in Kansas City, Missouri. My sincere appreciation to all who came to the National World War I Museum and Memorial for the screening of “Black Jack Pershing: Love and War” in Kansas City, Missouri on August 2. Our audience of roughly 130 asked questions about General Pershing’s promotion over 800 more senior officers to the rank of brigadier general. Thus began his ascension to becoming the commander of U.S. forces in WWI and the highest-ranking active-duty officer in U.S. history. The audience wanted to know what Pershing might think of today’s military and political scene in America. I told them I didn’t think Pershing would approve. 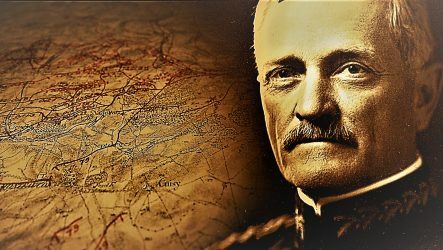 They asked about Pershing’s strategic tactics in WWI that began with large U.S. combat casualties and ended with Germany’s surrender to the Allies in 1918. I was honored to have retired lieutenant colonel Shawn Faulkner, an outstanding military historian at Fort Leavenworth’s U.S. Army Command and General Staff College, join me in the question-and-answer session after the screening of the documentary. It was a wonderful evening in one of America’s most beautiful war memorials. Did you know Pershing and the other four Allied commanders came to Kansas City to dedicate the war memorial in 1921? The event may have drawn the largest crowd in Kansas City history. By the way, the National WWI Museum and Memorial is the largest of its kind in America. There is no current WWI memorial in Washington, D.C. to pay tribute to the 4-million American men and women who served and sacrificed in the Great War. More than four million American families sent their sons and daughters to serve in uniform during the Great War. 116,516 U.S. soldiers died from combat and disease. Another 200,000 were wounded, a casualty rate far greater than in World War II. More than 350,000 African Americans served in the U.S. military, as did Native Americans and members of other minority groups. And, for the first time, women joined the ranks of the U.S. armed forces. Thanks to the U.S. World War I Centennial Commission, an effort to build a WWI memorial in Washington is now underway. They need your donations to complete the beautiful memorial sculpted bronze-relief mural wall which will occupy Pershing Park in our nation’s capital. To donate just click here. Thanks to NWWIMM curator Doran Cart and his fantastic staff for inviting me to screen the Pershing documentary in Kansas City. Thanks to Amy Struthers, interim dean of the UNL College of Journalism and Mass Communications who drove down to Kansas City from Lincoln to attend the screening and meet with CoJMC alumna. And a very special thanks to Rebecca Richmond and her son Tyler who came to our screening. Becky’s husband Brad was one of the videographers and an enthusiastic supporter of the Pershing documentary project. Brad passed away this summer after a long battle with cancer. He was a former TV News colleague, a great father and husband, a protector of animals, and a dear friend of mine.